This article originally appeared in the “School Days” column of the Thunder Bay Chronicle-Journal on Monday, April 7, 2014. We thank the author for graciously allowing us to re-post it here. Sitting in the Thunder Bay Airport on March 6, 22 St. Patrick’s High School students and 19 St. Ignatius students anxiously awaited their boarding call. Their destination: Europe – to mark the 100th anniversary of the start of the First World War, the 75th anniversary of the Second World War, and the 70th anniversary of D-Day. The students were joined by Mr. Cappello, Mr. Battistel, and Ms. Borgo of St. Pat’s along with Mr. McWhirter, Ms. Papich, and Ms. Vidotto of St. Ignatius. During their ten day journey, the students travelled through the Netherlands, Belgium, and France. All of the sites were selected to be part of the tour for their historical significance. Highlights of the trip included visits to the Anne Frank House, the Vimy Memorial, Dieppe beach, Juno beach, multiple war cemeteries, and Paris. The main purpose of the trip was to pay respect to those who sacrificed their lives for our freedom. To both teachers and students, the perspective the trip provided was extremely beneficial. 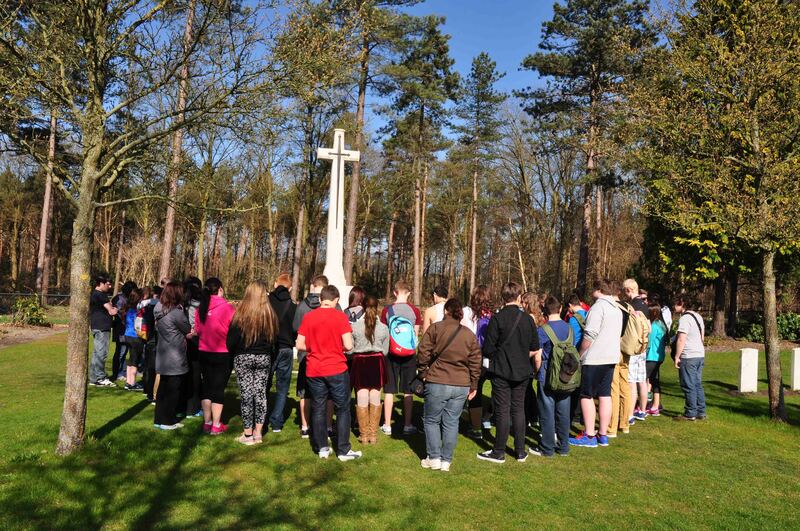 St. Ignatius and St. Patrick students pray at the Bergen-op-Zoom Canadian War Cemetery, March 2014. Although many moments of the trip were sombre, there were many fun, lighthearted moments as well. The teacher chaperones enhanced the experience for the students. Throughout the trip, the teachers were like friends, creating a laughing, joking atmosphere while still providing insight into the history of the locations visited. As well, some locations, such as Amsterdam, had a lively, upbeat spirit that the students enjoyed. Jollineau described Amsterdam as “simply an amazing city,” with “amazing people” and “beautiful scenery”. Many students were also enthralled with Paris. Street vendors provided a source of amusement outside of famous landmarks. They also visited the Louvre, seeing world-renowned items such as the Mona Lisa and Hammurabi’s Code. The experience was one that both students and teachers will remember for a long time. It not only gave them a chance to explore Europe, but it also gave them the opportunity to learn about history in the very places it was made. More stories and pictures can be found in Mr. Battistel’s blog posts chronicling the trip at stpatssocialscience.com. Reblogged this on Poverty, Agony, Distress & Want!.